This chapter deals with spatial statistics applied to point patterns. 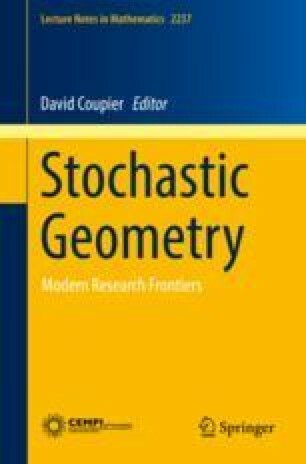 As well as in many specialized books, spatial point patterns are usually treated elaborately in books devoted to spatial statistics or stochastic geometry. Our aim is to propose a different point of view as we intend to present how we can understand and analyze a point pattern through intensity and conditional intensity functions. We present these key-ingredients theoretically and in an intuitive way. Then, we list some of the main spatial point processes models and provide their main characteristics, in particular, when available the form of their intensity and conditional intensity functions. Finally, we provide a non exhaustive list of statistical methodologies to estimate these functions and discuss the pros and cons of each method. A part of the material presented here is the fruit of several collaborations. We take the opportunity to thank our main collaborators David Dereudre, Jesper Møller, Ege Rubak and Rasmus Waagepetersen. We are also grateful to Christophe Biscio, Achmad Choiruddin, Rémy Drouilhet, Yongtao Guan and Frédérique Letué. This contribution has been partly supported by the program ANR-11-LABX-0020-01.